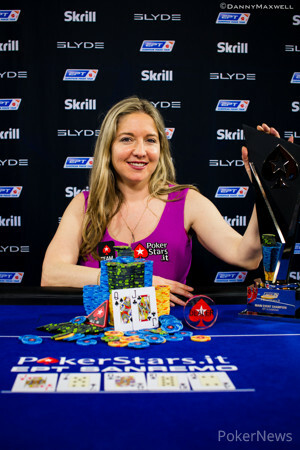 Vicky Coren Mitchell Becomes The First Ever Two Time EPT Champion by Winning the PokerStars.it EPT San Remo for €476,100! The PokerStars.it European Poker Tour Sanremo Season 10 has a winner, and it's a mainstream celebrity. It's a lady. It's a Team PokerStars Pro. And she started out as the absolute short stack. Can poker stories get any better? For Vicky Coren Mitchell it can't! She won the 16th ever EPT back in London Season 3, and now she's won the 98th EPT to write poker history. As per usual eight players started the final table at noon and one came out victorious. Just about everything between the start and 10 p.m., the time it took to play down to a winner, wasn't so usual. Besides Jordan Westmorland and Coren Mitchell, just about everyone showed some unusual plays during the day. Very loose opens from early positions appeared to be rather the rule than the exception, and more than once people got in trouble because of it. The first really bizarre thing at the final table was Giacomo Fundaro's absence for twenty minutes. Since the 26th level hadn't finished when play halted on Day 5, they continued with that level at the start of the final day. Before play, all players had been informed that there wouldn't be a break after the 26th level and that they would go straight on to the next level. Fundaro apparently hadn't gotten the memo and took his break while the remaining seven players played on. As if things hadn't been ridiculous enough from the start, the bust out hand of Emmanuel Pariset followed soon after. The sympathetic Frenchman will no doubt have nightmares about the hand for quite some time. After displaying a perfectly working push-or-fold strategy on the fourth and fifth day, he played a postflop pot or two on the sixth. In the first one he folded the best hand against Westmorland, in the second he got in even more trouble. In that hand Westmorland opened with a min-raise to 100,000 with and Pariset called with in position. Andrea Benelli squeezed to 325,000 from the blinds holding . Westmorland folded, and Pariset made the call. The flop brought the and Pariset announced all in out of turn. It was Benelli who was first to act, but he now checked to make the easy call a second later. Pariset was drawing very slim, and though he picked up a flush draw on the turn, was busted seconds later. He took home €53,100 for his eight-place finish. Andrija Martic was the next to go. He never really got things going and a bad beat ended his nightmare final table. He seemed to know what he was doing with plenty of online experience, but playing the same game live did seem to make him tense. He just didn't look comfortable at the final table. He lost a big hand first to Benelli where he flatted preflop with ace-king and got in trouble on a king-high board. Benelli had flopped a straight and got a lot of Martic's chips. In his last hand he lost with ace-jack to the flush Benelli's made with king-jack suited. Bruno Stefanelli was next on the list of people to go out. The crucial pot to his tournament was again a remarkable one. In that hand Fundaro opened the cutoff with ace-deuce off and Stefanelli called on the button with sixes. On an eigth-deuce-trey flop Fundaro checked. Stefanelli bet out 155,000 and was met by a raise to 1,000,000, a bet that would mean Stefanelli had to commit all of his chips should he call. He eventually laid down the best hand, leaving himself with not much behind. Not much later he ran his ace-jack into Westmorland's jacks and that was it for Stefanelli. Andreas Goeller was the next on the executioner's list. Goeler had gotten short and pushed all in with on a board against Westmorland's bet. Westmorland had for the pair and flush draw and wasn't going anywhere. He called, spiked a trey on the turn, and sent yet another Italian to the rail in fifth. Coren Mitchell in the meantime was holding on. The dream of becoming the first two-time EPT champion was still alive, though she admitted not really thinking about that beforehand. She was already happy making the final table, and didn't have too high hopes as she started out as the short stack. Pushing in the right spots, a nice four-bet bluff here, a cold four-bet shove with nines there, and well-timed steals made for a superb showing. Thousands of viewers new to poker came watch her on the EPT live stream and they got taught the game by someone who's a Team PokerStars Pro but isn't even playing full time. When she doubled with ace-king through Westmorland's ace-queen she had serious chips for the first time at the final table. Coren continued to show that her skill set didn't just include short-stack play, but that she knew her way around with more chips in front of her as well. It wasn't just Coren showing the viewers how to play poker though. Westmorland, the online wunderkind, made for some good entertainment. He made nice laydowns, perfect value bets and really had Benelli's number. In one hand he got Benelli to call with queen-high. In another one he flopped a flush and got Benelli to hero call of for a huge chunk of chips with just a pair of aces on a four-flush board. Benelli was visibly on tilt after that hand. It appeared as if Benelli could use the break that followed, though he was still the next one to be eliminated. Two times in a row he got three-bet by Westmorland and he didn't get away cheap. He was getting shorter and shorter. While he started the day on a little bit of a heater, the deck was ice cold for him when he least needed it to be. Eventually he had to go all in with king-ten and Fundaro made the call with queen-ten and hit two pair. At the start of three-handed play, Coren Mitchell was still the short stack. She battled her way back though and left the short stack when she picked up a big pot with pocket sixes. The chip lead changed hands between Fundaro and Westmorland in the meantime, but Coren Mitchell wasn't losing ground. To the contrary, she took the second spot on the leaderboard in a hand where she flopped trips in a limped pot. Fundano was the one falling down to third after not getting away cheaply from ace-king. The biggest hand of the tournament was still yet to come. Westmorland raised his button for 200,000 with and Coren Mitchell made it 500,000 to go from the big blind with . Westmorland made the call, the flop fell , and Coren Mitchell checked. Westmorland bet 550,000 and Coren Mitchell check raised to 1,200,000. Westmorland thought about it for a while and made the call. The turn card was the and both players checked. The river card was the and when Coren Mitchell bet 1,500,000. Westmorland shoved all in and Coren Mitchell thought for a while before calling with the best hand. This let Westmorland severely crippled. With just eight blinds left something needed to happen, and it did — though it wasn't good for him. He called al lin in with queen-six suited and was up against Coren Mitchell's ace-trey. He hit a six on the turn but the river was an ace and he departed from the tournament in third place. Just like that Coren Mitchell was heads up for the title. Heads up for a €476,100 first prize. Heads up to become the first ever two-time EPT champion. Heads up to write poker history. It wouldn't take long to make that dream a reality. She played like a champ and got some help from the deck in the last hand. She raised it up to 260,000 from the button with . Fundaro just flat called with . The flop came giving Coren Mitchell two pair. Fundaro checked and Coren Mitchell bet 350,000. Fundaro then check-raised to 825,000 and Coren Mitchell called. The fell on the turn and Fundaro checked again. Fundaro went for the double check-raise and pushed all in over Coren-Mitchell's one million bet. Coren Mitchell made the call. Coren Mitchell was on the verge of eliminating her opponent, on the verge of winning the tournament, and becoming the first ever two-time EPT champion. She just needed to fade the aces, kings, and sevens. The commentators on the live stream couldn't hold their excitement and yelled for Coren Mitchell's hand to hold. And it did. The on the river was a blank and Coren Mitchell got up from the table and hugged her opponent. She couldn't believe what had just happened. 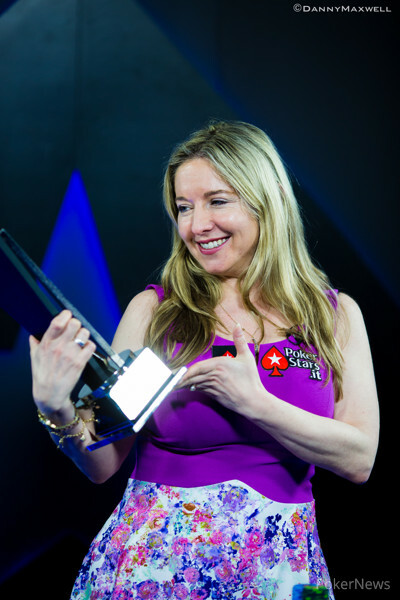 The poker world now has the first two time champion and her name is Victoria Coren Mitchell! She takes home a first place prize of €476,100 and a stunning watch worth more than €5,000 from luxury Swiss brand SLYDE, the Official Watch Sponsor for EPT Season 10 Main and High Roller Events, after beating a 556-strong field in Italy's Sanremo. Vicky Coren Mitchell raised on the button to 260,000 with and Giacomo Fundaro called with . The flop was and Fundaro checked. Coren Mitchell got a count of her opponents stack and called. The turn card was the and Fundaro checked again. Coren Mitchell didn’t slow down with her two pair and bet 1,000,000. Fundaro now moved all in and Coren Mitchell made the call. The river card was the . 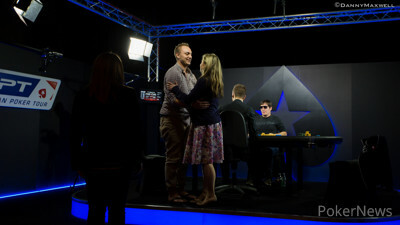 Fundaro was beaten in second place and rose to congratulate his stunned opponent, the winner and two- time EPT Champion Coren Mitchell. Giacomo Fundaro opened for 245,000 on the button with the and Vicky Coren Mitchell defended with the . The flop saw Coren Mitchell check-call a bet of 275,000, and then she led out for 700,000 on the turn. The unconventional play worked as Fundaro released his hand. Coren Mitchell opened her button for 250,000 and Fundaro called with . Both players checked the and the fell on the turn. Fundaro bet out 305,000 and Coren Mitchell made the call. The on the river made the Italian player bet 975,000. Coren Mitchell folded the best hand and off they were to the second hand of heads up. Poker players around the world love using Skrill to deposit and withdraw from their favorite poker sites. Not only is Skrill great for managing your poker funds, it can be used for anything you do online! 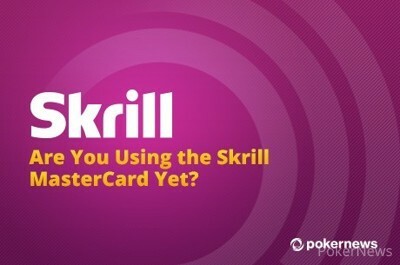 Here at PokerNews we highly recommend using Skrill as your e-wallet. Here are the top five reasons why. Once you get yourself a Skrill account, you suddenly have something you can use it in absolutely all world’s best online poker rooms. That's right, just about every poker room uses Skrill making it easy to not only deposit and withdraw, but also transfer balances between poker rooms. Many retailers around the world use Skrill. The security protocols in use make Skrill a much safer choice to use than any other e-wallet. This means that your balances are perfectly safe on Skrill, especially if you use their state-of-the-art security token to access your account. Skrill's Mastercard makes it easy to not only withdraw funds from just about any ATM machine, but also allows you access to shopping at almost any online or offline store using the balance in your account. Plus, the card has very low operations and transactions costs - which makes it ideal for travelers seeking for quick ways to some some money. Yes, the iOS / Android apps let you handle payments on-the-go - Their easy to manage apps allow you immediate access to your funds no matter where you are. That's right: you try Skrill and we get you $20 to start your Skrill-adventure. Skrill wants you to have $20 just for signing up for a free account via PokerNews. All you have to do is sign up for an account through us, deposit $20 or more to your favorite poker room using Skrill, and within 1 business day you will receive $20 for free! With all these excellent reasons it is easy to see why Skrill is the right e-wallet for you. Create your Skrill account through PokerNews today and start enjoying all the benefits Skrill has to offer! Giacomo Fundaro raised 225,000 with from the button and Vicky Coren Mitchell called in the big blind . The flop was . Coren Mitchell checked and when Fundaro bet 300,00, Coren Mitchell check raised him to 750,000. The players are back in their seats, play continues! 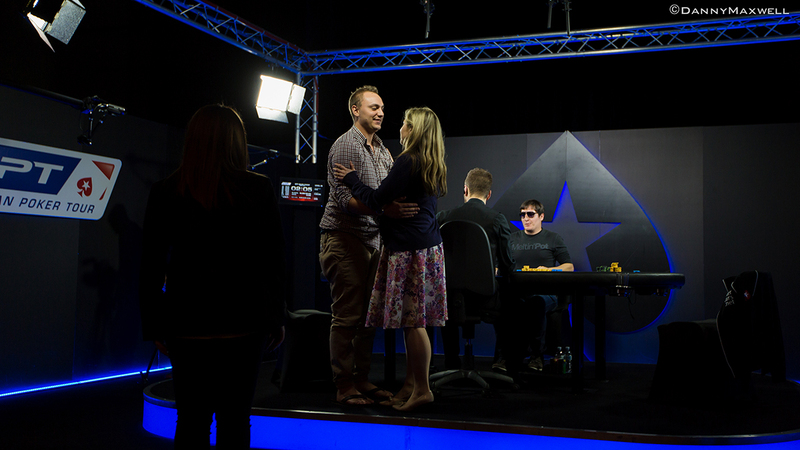 Jordan Westmorland was down to just 800,000 after that big hand with Vicky Coren Mitchell. The first hand after that huge set back he got a walk in the big blind. The second hand he shoved allin with and Fundaro folded. The third hand he folded his seven-three. The fourth hand he wouldn't get away from though. Coren Mitchell shoved from the small blind and Westmorland called from the big blind for about a million with . Coren Mitchell tabled . Coren Mitchell was ahead and would stay on top after the flop. The on the turn was everything but a blank though, all of the sudden Westmorland was on the verge of doubling up to a twenty big blind stack. The on the river changed that prospect again and Westmorland got up from the table to make his exit. Coren Mitchell got up from the table as well and hugged her opponent, again kind of apologizing for the big beat and not snap call in that huge hand minutes ago. 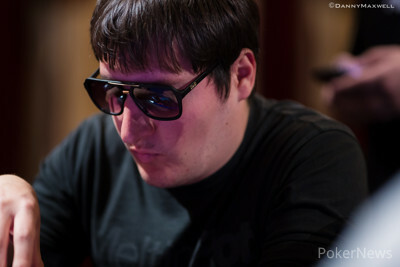 Coren Mitchell is heads up in the PokerStars.it EPT Main Event with a big lead over Giacomo Fundaro. Play continues in a few minutes while the tournament organization sets up the table for heads up play. Will Coren Mitchell become the first two time EPT champion? Both are guaranteed €298,700 right now for second place, but both are eying that first prize of €476,100.